Change involves moving from current state to a desired future state. It requires energy and commitment, fuelled by the belief that the future state is both possible and worth attaining. How can you inspire people to believe in, and work towards, something that does not yet exist and that is therefore impossible to see? We strongly believe in the power of visual thinking to accelerate the understanding and collaboration needed for change. Vision is by far our most dominant sense. It takes up half of our brain’s resources  and over 80% of new information is handled through the visual system . Images trump words in both understanding and memory. We know from research on the Picture Superiority Effect that after three days people remember only 10% of information presented verbally, versus 65% if that same information is accompanied by a picture . Explore, define and communicate what exists only in the imagination. Transform what is ambiguous and vague into something concrete and clear. Shape multiple perspectives into a shared point of view. 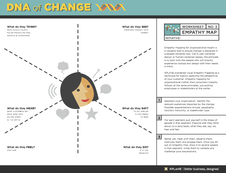 Ask people to draw the desired change and share with the group to uncover multiple perspectives and find common ground. Draw a line from complete disagreement to agreement on an issue. Ask people to mark their position on the line. (Repeat and compare over time). Draw a sketch of key stakeholders and discuss what they’re seeing, hearing, saying, feeling and doing. How will the change affect them? Maia Garau is a Senior Consultant at XPLANE. John Medina. Brain Rules. Pear Press, Seattle WA, 2008. U.S. Department of Labor, OSHA Office of Training and Education. Presenting Effective Presentations with Visual Aids. 1996.